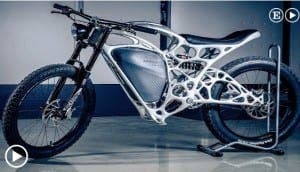 THE world’s first 3D-printed motorcycle has arrived. ced by European consortium Airbus and APWork, the vehicle weighs 35kg and can reach 80 km/h. Spain is a pioneer in 3D printing and the country made headlines when it brought the technology into the world of food and fine dining.